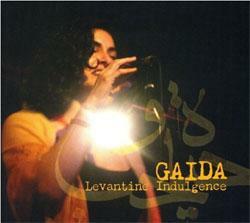 Singer and composer Gaida’s debut album Levantine Indulgence is named for Levant, the Fertile Crescent’s desert oasis. Aptly named, this album offers listeners an abundance of vocal and instrumental styles that even the most resistant listeners can find nourishing and enchanting. The opening track, “Dream,” begins with rhythmic clapping and percussion and a chorus of male voices who share vocals with the lead singer. I should clarify by referring to sharing and “trading.” This distinction is important because the contrast of Gaida’s voice with the male singers makes this short song into a true performance. The vocal banter between Gaida and the men reminded me of a musical where the lead female actor is center stage and the men in the chorus sing to her with the purpose of wooing or impressing her. But in the case of “Dream,” the men sing with Gaida at the end of the song. Unlike a traditional musical from an earlier era, where the woman needs to fend off potential suitors with clever lyrics and a silky voice, in this modern version Gaida works with the men, but the song is still decidedly hers. “Kaifa Uhibuka” transports the listener to a smoky, jazz club with purple walls and red, plush booths. When I close my eyes and listen to this track, I’m a patron of this club, sipping gin and smoking a clove cigarette, while I lean back into my lush surroundings to enjoy the music. I despise gin and I no longer smoke, but the song evokes feelings of real or imagined indulgence, and yet sadness. I felt that this song represented the overall mood of the album even more than the title track. Another track that evoked this mood was the beautiful ballad “Ghayeb.” The piano, cello, and flute blend with Gaida’s vocals to create a song that expresses love, longing, and caring. Despite the fact that the lyrics are not in English, my eyes filled with tears as I listened to “Ghayeb.” Without even knowing what Gaida was saying, I could feel the pain and loss in her voice. When you hear a song like this, it can cause you to have a flashback to a situation that may have been painful, or one that caused you to feel a sense of bittersweet regret. Granted, this isn’t exactly a desirable feeling, but if a song can make you feel this way, I think that’s pretty powerful.